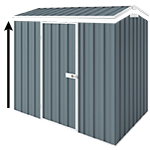 This medium size Sidemate vinyl outdoor storage shed designed to be placed right against the side of your home to save you even more space in your backyard. The Sidemate 4x8 vinyl shed is a medium sized shed and designed to be placed right against the side of your home to save you even more space in your backyard. You can certainly fit a bike or two in it and all your gardening tools. For extra strength and durability wall columns are reinforced inside by a solid steel structure, which can also be used to hang gardening tools, or shelves to make your shed well organised. Foundation kit is added to this shed so you don’t have to spend money on getting a concrete slab done or if you are after a temporary storage solution only. Does it come with a door on each side ? I need something that still retains my side of house through t back garden access. If this has a door on each side it would be ideal. Thanks. Hi there, can you tell me if this model allows you to change the position of the door for instance Swap the middle side panel with the door? Do I have to pay extra for foundation kit?Or is it included?